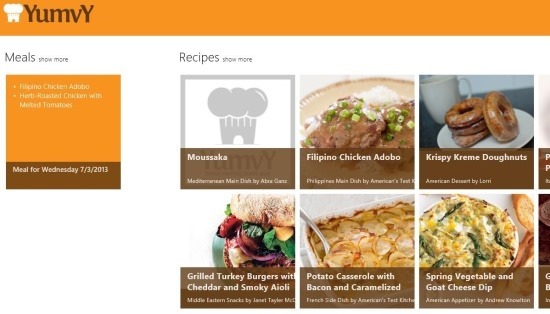 Yumvy Cooking Companion is a free Windows 8 cooking app. This recipe app not only tells you what ingredients you need, how to cook, etc., it also guides you through the cooking process by setting timers. So, once you start cooking, this app will alert you when to add ingredients, when to OFF the stove, etc. This app also guides you to cook up to 4 dishes at a time. 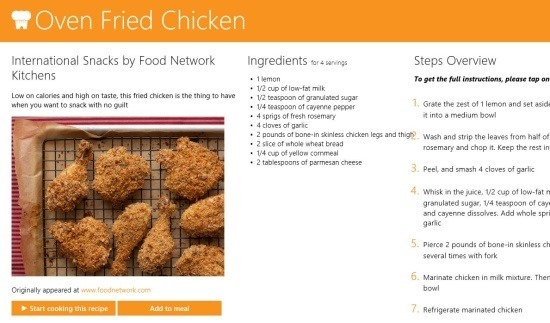 You just need an internet connection to update new recipes, from time to time. YumvY interface is easy to understand and use. The home page as shown below, has just the bookmarked meals and recipes. As you scroll along, you will see some recipes. If you wish to see more varieties of recipes just click on Recipes, so that you will see more variety of dishes. Click on any recipe and you can see the ingredients used and steps to cook the dish. You can also add the dish to your meal list or use the Start cooking button to take guidance from the app to cook the dish. When you click on Start Cooking This Recipe, then you will be shown each step in a special interface. You will also be asked, how many servings and number of cooks. This is where the app differs from others apps. For some steps, where timers are needed the app itself sets the timer when you are ready and warns you. Meanwhile the steps which can be carried out will be shown when you click next. So, this app will warn you and not let you burn down your recipes while you concentrate on other things. If you are planning to cook multiple recipes at one shot, then add them to your meal list. Then the app will show them at one time. It will open multiple sections to guide you cook the recipes. It will show the shopping list and also when you click on Start cooking, choose the number of cooks and servings to help you do the dishes accordingly. This dynamic app is free. 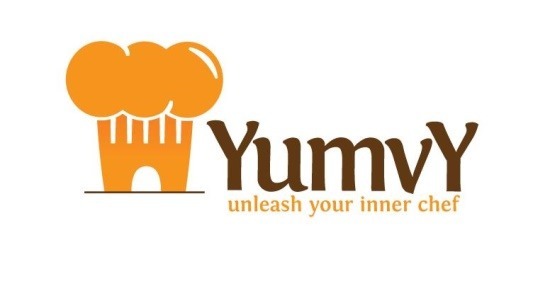 YumvY combines and prioritizes the steps of cooking, to save your time. 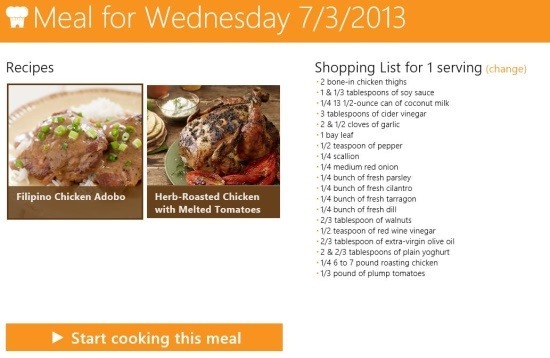 Add multiple recipes to your meal list. 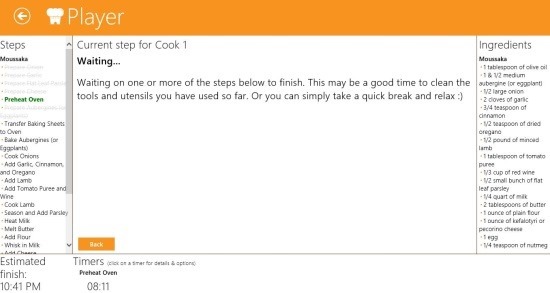 This Windows 8 Cooking App creates timers and reminders. You can cook up to 4 recipes, simultaneously. The app works in Snap mode too. Click on this link and use the View In Windows Store button to open the app in app store. From there install the app on your Windows 8 device. 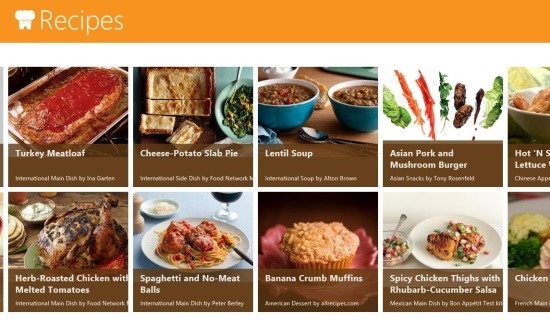 You can also try: Epicurious and Pepper plate app on your Windows 8 for more cooking recipes.